In five weeks, October 9-11, hundreds in the education field will be joining us in Tucson, Arizona, for NCFL’s Families Learning Conference. You don’t want to miss out! These three days will be packed with outstanding speakers and education experts who will share trends in research, new models for educating, and information that will help you further engage your families. 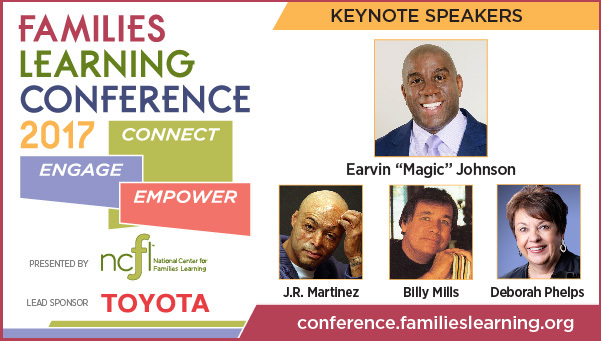 Be inspired by our four keynote speakers, Deborah Phelps, Magic Johnson, Billy Mills, and J.R. Martinez! You will be re-energized to continue your good work in literacy and family learning. Registrations and hotel rooms are filling up. Don’t miss out on this great opportunity. Register today at conference.familieslearning.org.